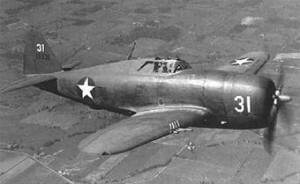 On March 24, 1943, two Army P-47B fighter aircraft (41-6002) and (41-6040) were training over southern Rhode Island when both were forced to land for reasons not stated in the press. One plane, piloted by Flight Officer Oscar C. Kline, 22, of Barrington, New Jersey, came down on Nooseneck Hill Road in West Greenwich, barely missing an automobile before cartwheeling into the woods lining the east side of the highway. The plane caught fire but did not explode. The flames were quickly extinguished by the driver of the vehicle that was almost hit, and some other passers by, using brush-fire pump cans obtained from the nearby home of Richmond’s Chief of Police, John Potter. Unfortunately Flight Officer Kline died as he was removed from the plane. The second P-47B landed about a mile-and-a-half farther down Nooseneck Hill Road in the town of Richmond, near Dawley Memorial Park. Witnesses told investigators that the two P-47s had circled the area several times with their wheels down before attempting to land.